Government approves egalitarian prayer section near Robinson's arch, promises to make it respectable and accessible to all. 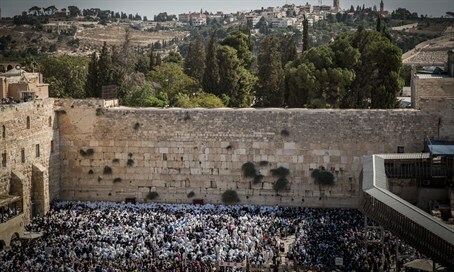 Following a long and intense year-long debate, the cabinet voted in favor of establishing a section of the Western Wall for mixed prayers. Prime Minister Binyamin Netanyahu addressed the issue at the beginning of the Cabinet meeting on Sunday, noting that, "last year at my behest, [there was work] to try and reach a solution on the question of the Women of the Wall." "Today, in your last meeting here, we will submit the summary of your work on the issue, i.e. a compromise on this delicate issue in a place that is supposed to unite the Jewish People." According to the proposed agreement, a new prayer area will be set up along the wall south of where the current prayer area is and will be deemed the Israel congregation area near Robinson’s arch. While the Mughrabi bridge will still separate the areas of the main Western Wall plaza from the Robinson’s arch area, a new entrance will be developed that will provide entry to all three locations. The new proposal suggests that the Robinson’s arch prayer area will be set up as a respectable, accessible, and sightly area that will be an extension of the existing plaza. However, due to the international sensitivities to construction in the area, the site will not be directly linked to the existing plaza. Haredi ministers voted against the plan, but the parties did not torpedo the proposal outright nor create a coalition crisis over the issue, as even sources in the haredi parties agreed that this plan was the least of all evils. The cost of the new plan is estimated at over 45 million shekels and according to sources in the Likud, Likud ministers Ze’ev Elkin, Miri Regev, and Yariv Levin refused to allocate money to the project from their own ministries. The money will therefore be allocated from the Prime Minister’s Office, the Treasury, and the Ministry of the Diaspora who will pool together 25 million shekels, and the Jewish Agency will fund another ten million according to the government decision. 10 millions shekel are still missing and the plan is to raise that money over the coming month.